Thread: The last thing you ate? I am sad to hear of your sister’s predicament. I was not a big fan of fast food but ever since my weight issues I am encouraged to eat it occasionally. Germany does not allowed GMO or Antibiotic Chicken if I recall correct. I personally do not like fast food chicken or fish. I stick to burger or pizza for a treat. I have also tried to make the Korean pickled food called Kimchi. Half Korean half German friend from school introduced me to this food it is very delicious and easy to make just takes times. I think perhaps your Father would love it’s taste. Ah no, that was my sister's friend. Thanks for Kimchi suggestion! I've heard about Kimchi, but I never tried them myself. I'll mention them to my dad will see if he ever had Kimchi. Ive just searched Kimchi on the internet, and they look really good! Last edited by Marinera; Mar-18-2019 at 12:30. I made a Beef & Ale pie for dinner with honey roasted veg (carrot, baby potatoes, broccoli, corn cobs) with mash potatoes also for Father. Mother has not eaten much lately as things are not so optimistic health wise with her cancer. However today we are blessed she ate half of the whole pie I would say and much if the sides. I have the happiest feeling will make another pie in a few days see how well she eats. I am sorry to hear about your mother's poor health and I hope she gets well soon. Now you can take it or leave it, it's up to you of course, but it's likely that raw vegetables can help. I've seen it mentioned by several people who were diagnosed with cancer, and also my good friend once told me that she new someone who cured their cancer just with raw beetroots and carrots, probably meaning they ate a lot of them, or perhaps exclusively only those two vegetables and nothing else, now I'm sorry I didn't ask her for details. There's a blog of a guy who had cancer and he's not the only one who writes about it and the benefits of vegetables as well https://foodrevolution.org/blog/cancer-fighting-foods/ Although, carrots seems to be pretty low on the scale of benefits according to the information he's got. Possibly it was beetroots that helped.. anyway beetroots are extremely good for improving bad blood and red cell count, that's actually for anyone who wants to improve their blood. Last edited by Marinera; Mar-18-2019 at 13:14. Thick layer of cream cheese slathered onto one of these and warmed. Delicious! 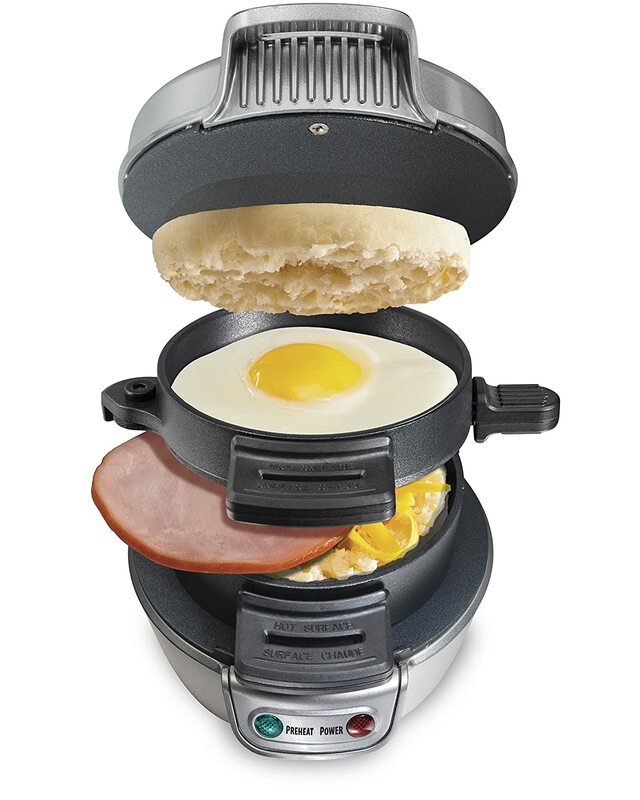 I’m alone in the house for a few days, so I got one of those gizmos that make breakfast sandwiches like Mickey D’s. It works, somewhat to my surprise! I made mine just like the picture with an English muffin, cheddar cheese, Canadian bacon, and a medium egg. Last edited by KenOC; Mar-21-2019 at 18:41. Still alone in the house. Ordered for delivery, only my second time aside from pizza. Yellow chicken Thai curry with onions, potatoes, and carrots along with rice – nicely spicy. Also crab Rangoon, served with a sweet dipping sauce of a color not found in nature. If I die from it, at least I’ll have a smile on my face.